I went looking at how potions have changed over the various versions in order to decide on a standard set of potions for myself. I was quite surprised at how conservative they've been. 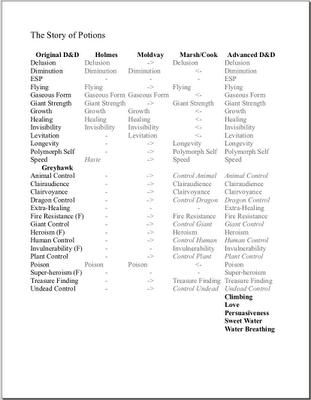 Here is a pdf from OD&D to 1e. Holmes and Moldvay are meant to only cover the first 3 levels of play. It's interesting that they streamlined the list of potions (10 for Holmes, 7 for Moldvay) which implies some potions are considered higher level, like spells would be-- or maybe some are less essential archetypally if you're streamlining. But, with the Marsh/Cook expert set, every streamlined potion has been added back except ESP, Extra-healing, and Super-heroism. It seems that some of these are drifting into the realm of too specific to be standards, Rainbow Hues? Where would that be useful outside of Carcosa? Elixir of Youth is a weak Longevity. Glibness doesn't seem different enough from Persuasiveness to warrant another potion. Philtre of Love and Sweet Water don't make the transition. Speech looks to be a replacement for Philtre of Persuasiveness. Note that Oil of Ethereality has become ingestible. Merging is another odd specific one. I'm guessing it's meant to be drunk by a thief who can then sneak the whole party past guards or something? Dreamspeech is like a combo of Speak with Dead and ESP. I do like Antidote and wonder why it took so long for it to appear. I like that you drink a potion and it gives you a limited time tool to use against the challenges of the underworld. I like that the effects are often limited to the imbiber's body. I wonder about some of these effects being replicated by other magic items; I want the different building blocks to feel different. For example, I want all the Control Potions to be scrolls. Why would drinking a potion let me control something outside of me? Yes, I know it's magic, but I mean the literature seems full of counter examples-- shapeshifters and Mr. Hydes. You don't use a potion to affect someone else, you use a wand. I wonder if there are other effects that would be good to add? Maybe the traditional ring power Water Walking? I don't like the idea of potions specific to certain classes, for example, fighters. It seems too fiddly. Besides, something like Invulnerability allows for a weak mage to be fighter-like, while Levitation allows the fighter to be mage-like. I would like to have 30 or less standard potions. Maybe 20 if I can trim it that far. I can always add weird oddities on top, but I'd like to have a stable base that players can learn about so they can start making decisions based on them. This is all a culmination of using random charts to determine potion qualities and magical effects. It was getting too random. And seems odd to ignore the building blocks that have worked for decades in play. Climbing makes more sense as goo you rub on hands and feet. This is more from roguelike computer games than D&D, but Fire Breathing would make an awesome potion effect. Polymorph Self potions should turn you into some fixed or random critter, not present you with a little menu that is like "what do you want to be today?" the only way the potions of ____ control make sense for me is if they cause some physical mutation (forking your tongue, narrowing your throat)--allowing you to speak in a certain way which those creatures recognize as they voice of their god. otherwise, yeah, scroll makes more sense. as for the whole idea of standard potions-i (of course) don't like it. But i DO like the idea of PCs being able to use and understand potions and go "oh, I ;ve seen that before" the only way it makes sense to me is if they're culturally specific, like "Oh we know this green-flecked concoction that smells like rotting cheese is a goblin concoction that makes you invisible". Which isn't to say all invisibilty potions look the same, just that that particular recipe is now known to the PCs. 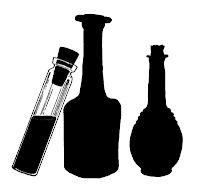 What is the history of the rule where PCs can taste these potions to figure out what they are? Does that change over the editions (or is it even explicit)? Interesting note, Mentzer Basic added back in ESP. Otherwise it's the same as Moldvay Basic. Mentzer Expert has the same list as Cook/Marsh Expert. All the rest in the RC were from Mentzer Companion. And I love that potion of antidote. It's one of my favorites to give out at low levels. @Roger: Yes, maybe for polymorph you could have: Birds, Reptiles, etc and then for the duration the player could be creative as needed becoming anything from hummingbird to ostrich. @Zak: It seems to be a trade off: the more detectable the magic, the more mundane, but the more variable the less you can utilize it. Because just the chance of getting the same goblin potion you learned again will be slim. But I think we can find a middle ground. And I like the idea that different cultures might have potions unique to them, and lack others. @SoE: As I read it, there was always the assumption that taking a sip would tell you what kind of potion it was, and that that would not "use up" the potion. It was interesting to see Moldvay and Mentzer saying every potion, even those of the same type, have different colors and flavors. If just sipping them will tell you the potion type why have different flavors? @LordG: Accch, thanks so much. I totally forgot Mentzer. I don't own a physical copy. Need to fix that too. I'm compiling the info on duration, miscibility, etc. Hope to post a part two tomorrow. I think Elasticity is one of the best of the later additions. Lots of possibilities there. You're probably right about potion of Merging. I think a better potion "of Merging" would be one that allowed you to melt into the wall or floor. One thing that's a little disappointing about potions is that by the rules they're usually these tiny perfume-sample-sized vials, whereas aesthetically I want them to be these great big flasks that you have to chug. Relatedly I think most potions should be at least about 90 proof alcoholic. There's probably room for a table of minor potion side-effects out there but "a good buzz" should be pretty much default. I think I would have the buzz/side-effect kick in after the potion effect wears off, though, otherwise who would want to use them as a tool, well flying drunk might be kinda funny.